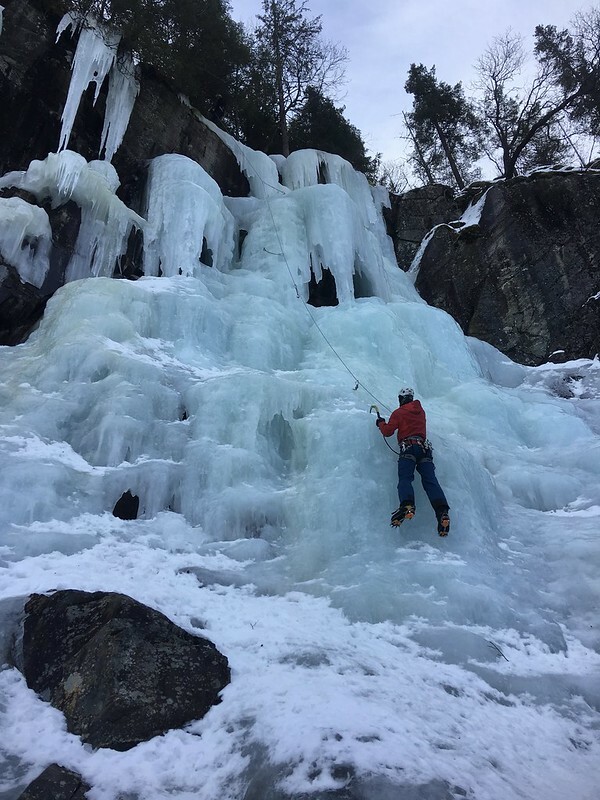 I never expected to love ice climbing. 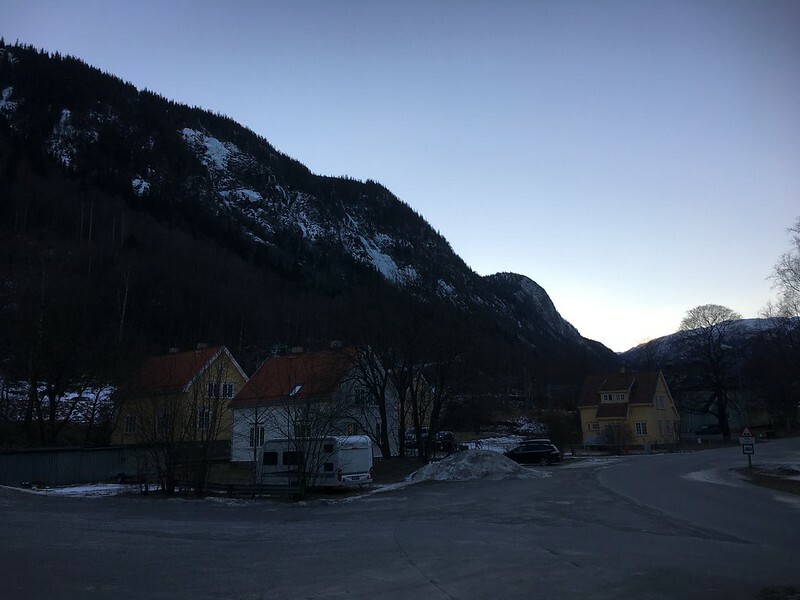 I also never expected to climb for 5 out of 6 days in Norway. I expected to find myself sight seeing and looking for a spa. 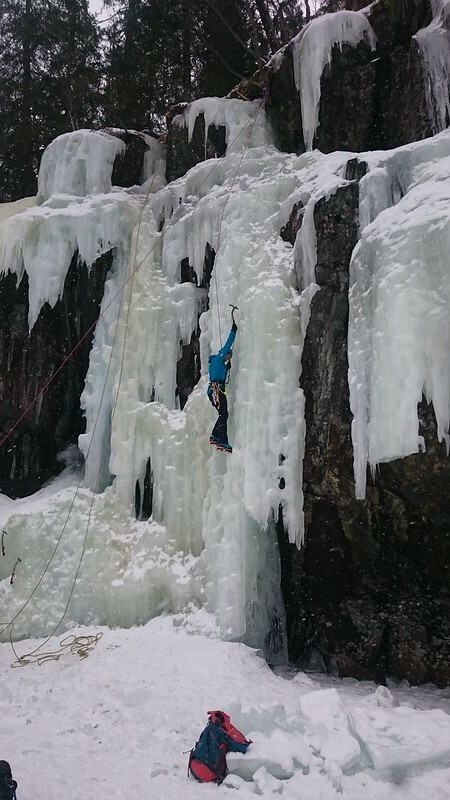 When I got the invite to go ice climbing in Rjukan, Norway from the Karabiner MC I genuinely though they were joking. To start with I’m not a full member yet. 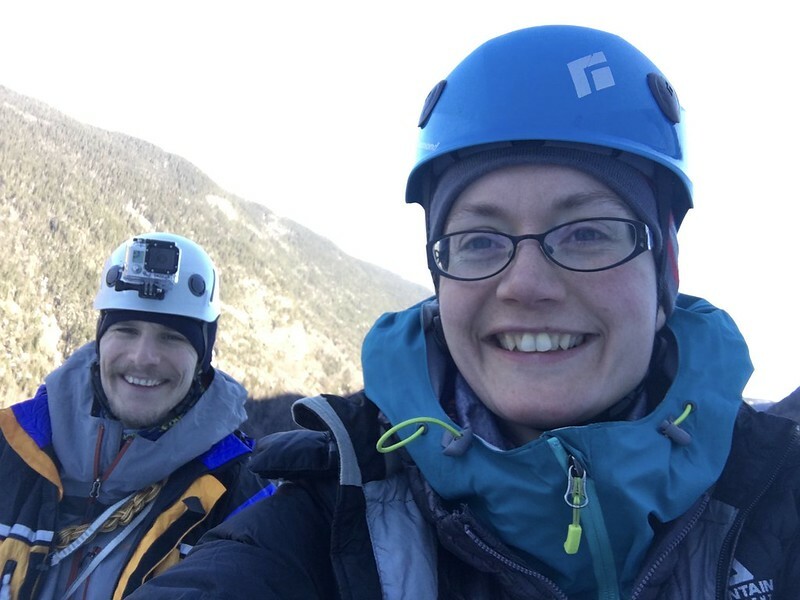 Then there’s the fact that any time I’ve been outdoor climbing with them it’s generally involved a lot of swearing, embarrassment and disco legs. And a few tears. But I hate to pass up any opportunity – I live with the Fear Of Missing Out. What if I never get the chance again? What if passing on this opportunity prevents me from reaching my Big Goal? 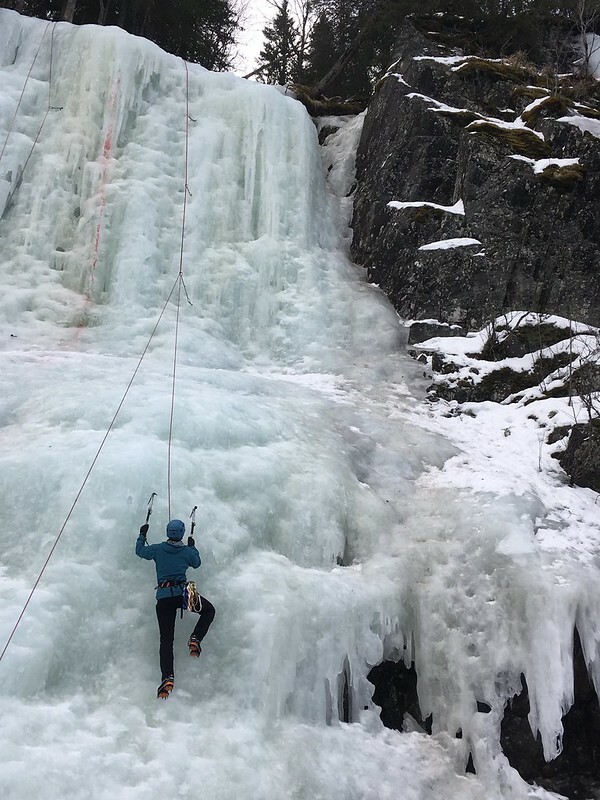 So armed with borrowed climbing axes and an unusual sense of optimism I headed off to Norway with a group of climbers who were either very experience on ice, or really good rock climbers. I am neither. 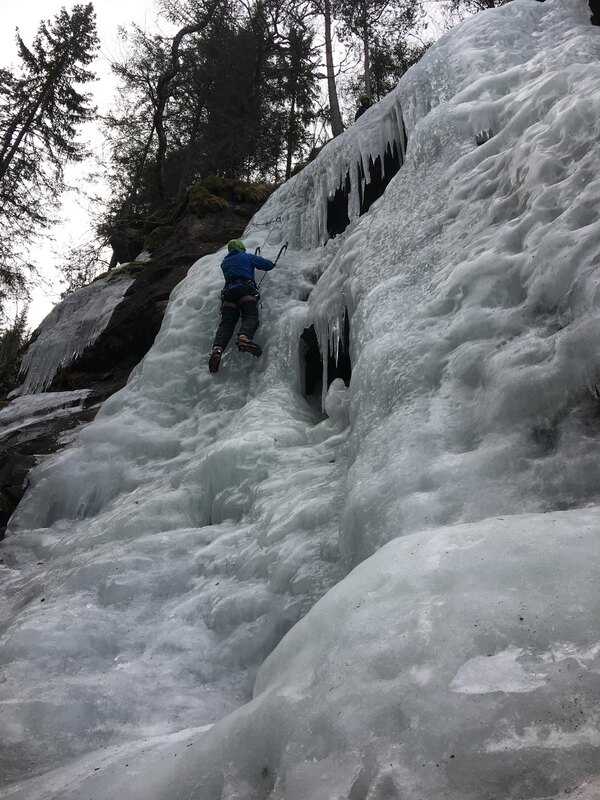 With years of winter mountaineering experience I do however have confidence in crampons so I didn’t expect to be overwhelmed by gear and technique. 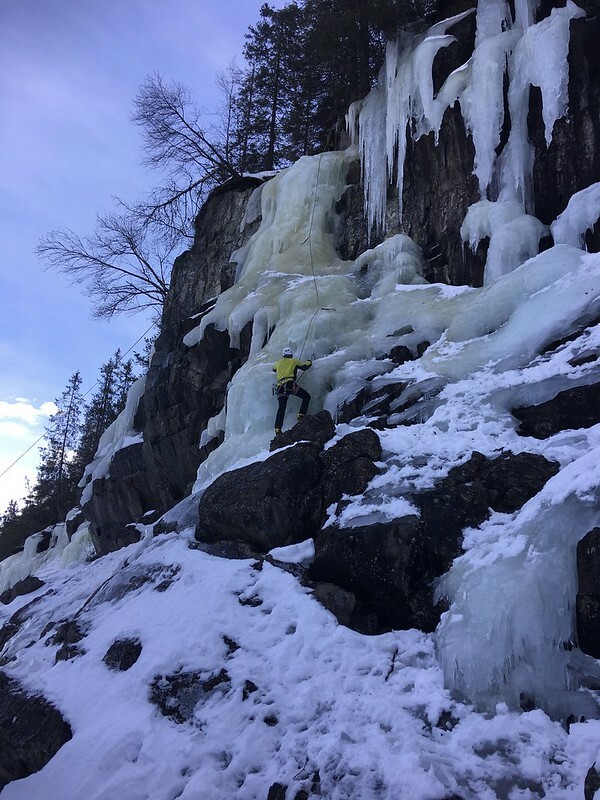 Rjukan is a fantastic place to go for a first trip water ice climbing – so if you can find some experienced friends willing to teach you, get yourself there. 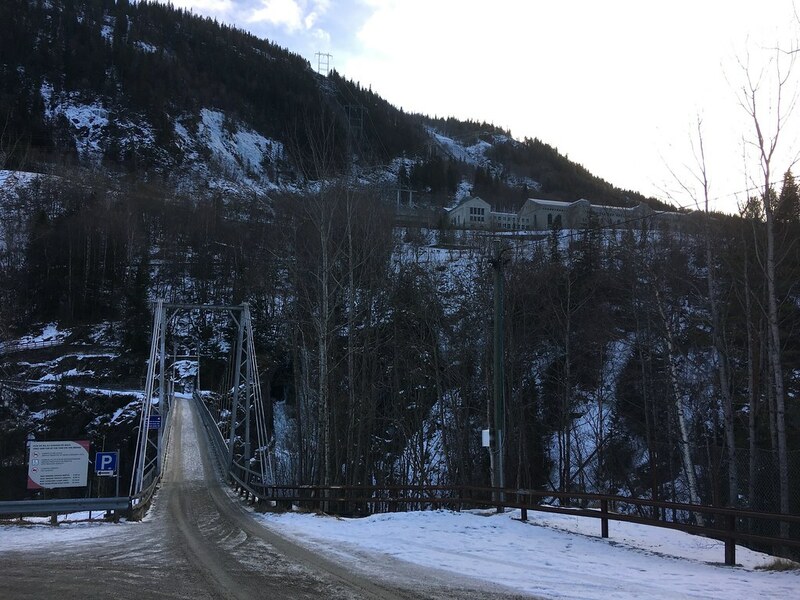 Only 3 hours drive from Oslo its really accessible and also a great venue for skiing, (which I can’t do either). 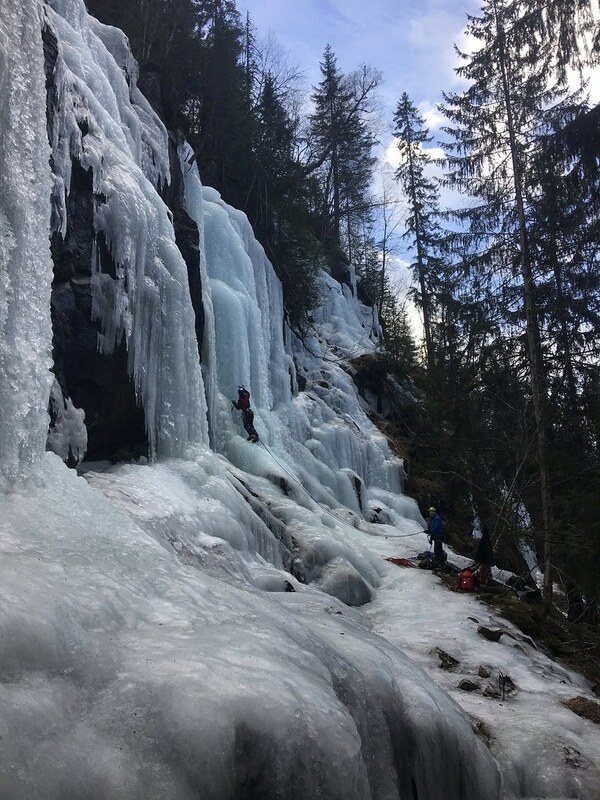 The first day was at Krokan, the ice equivalent of Stanage – loads of short waterfalls of varying grades and a short walk from the road. 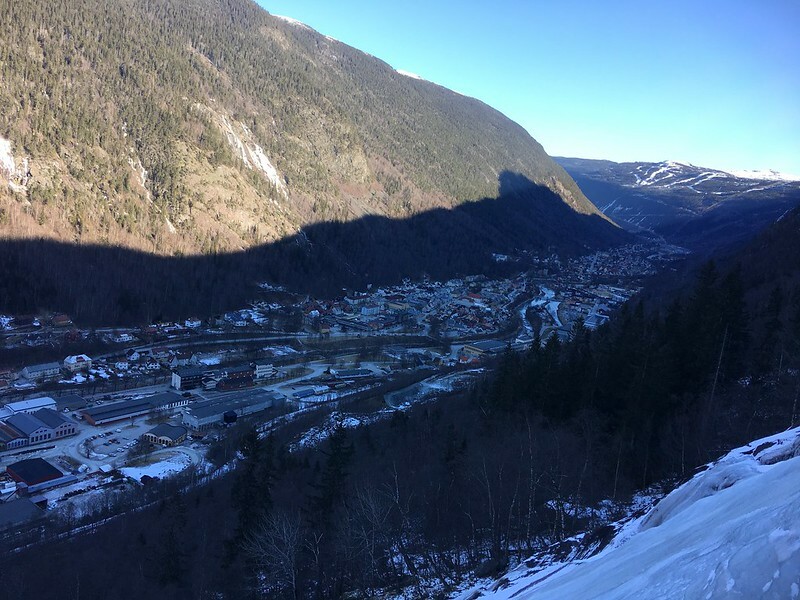 Its a reliable venue for climbing in the valley due to its elevation. It is also as busy as Stanage so get there early, especially at the weekend. 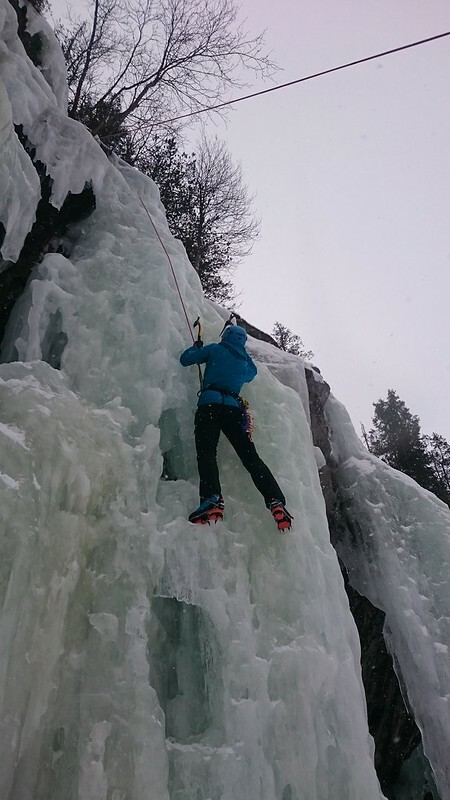 I managed to top rope and second 4 routes at Krokan – with my first being a WI4 – Kjøkkentrappa. Steep sections but at no point did I feel terrified in the way I do on rock. In fact after a day climbing here I was really excited about the rest of the week. 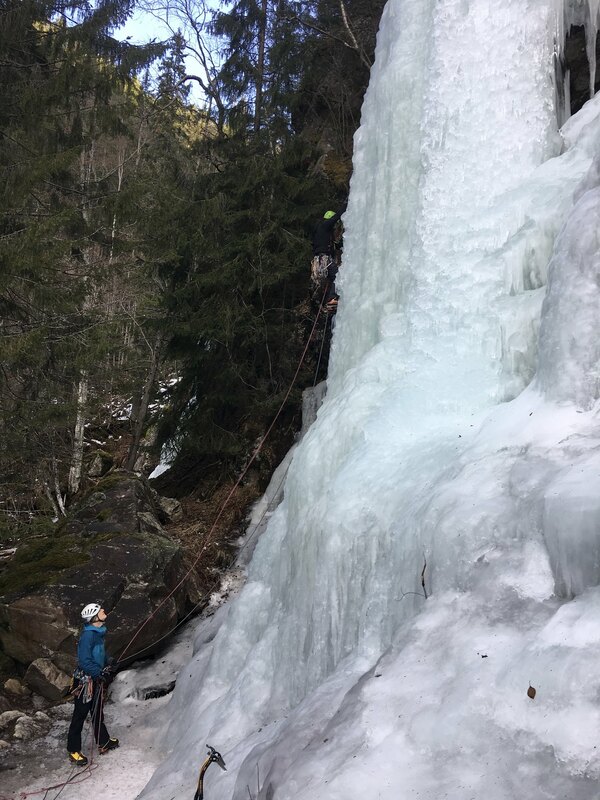 I had such a good time at Krokan and I was feeling really confident seconding some of the lower grades and so I was keen to led by the end of the week. The following day we headed to Ozzimosis – a series of waterfalls hidden in the woods. Again another good spot with easy grades and more classic routes. 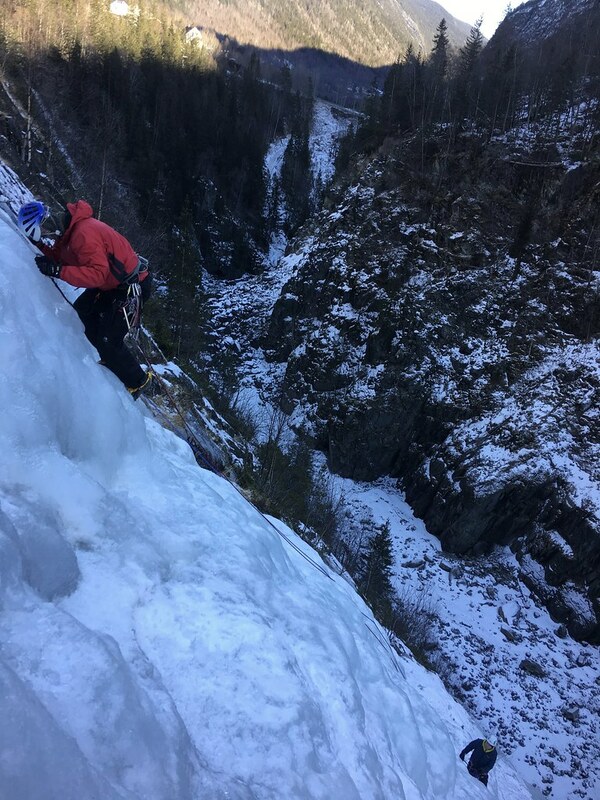 I seconded another 4 routes and I even perfected my abseil techniques. 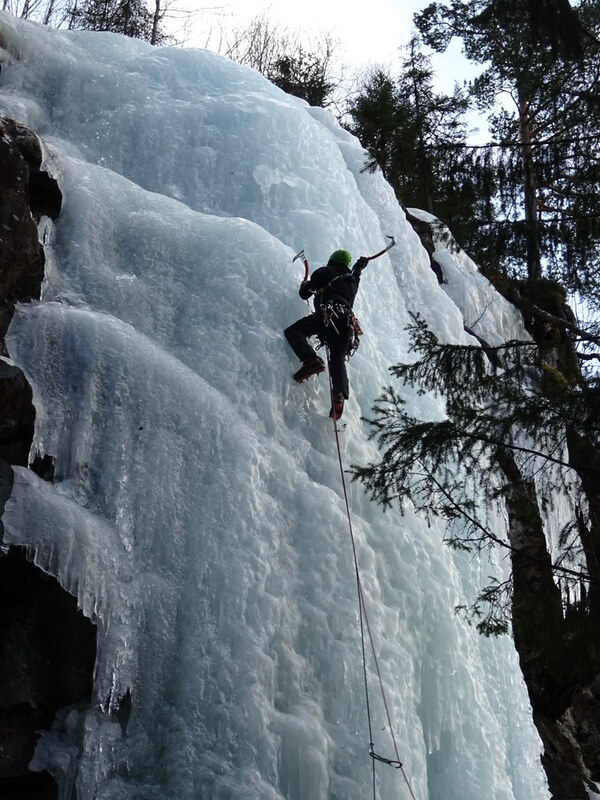 I hate abseiling but it’s an essential skill for water ice climbing as most waterfalls require an abseil off the top. 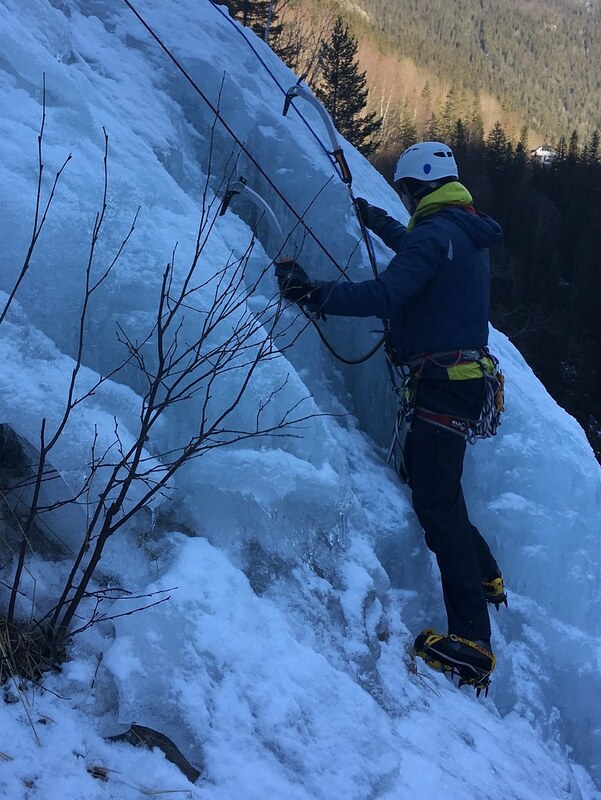 By perfected I mean after 20 minutes of dangling on my own with Andy laughing from the bottom I managed to get the jammed prussik knot to move so I could descend. Ozzimosis itself is a beast of a waterfall graded WI4 that I never got around to trying. 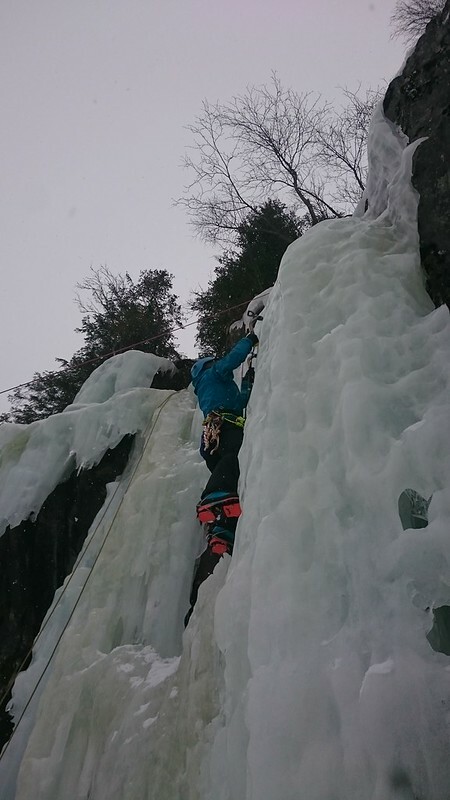 Andy was leading the route, Steve was belaying to second it and I was going to top rope. 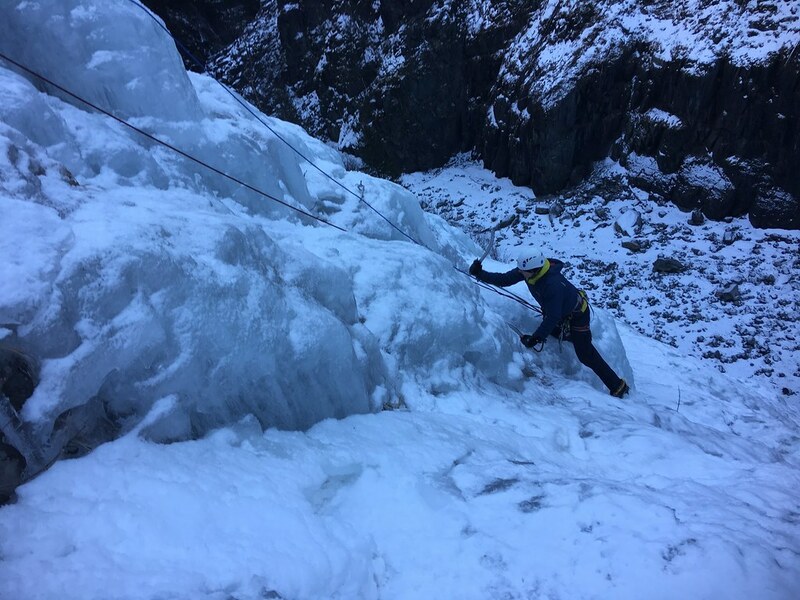 But as Andy was climbing he brought ice down on Steve’s arm, resulting in a lot of loud swearing a panicked rush from me to grab the rope from him while Andy made himself safe and a later trip to A&E to Steve – expensive but at least he was ok and back climbing later in the week. 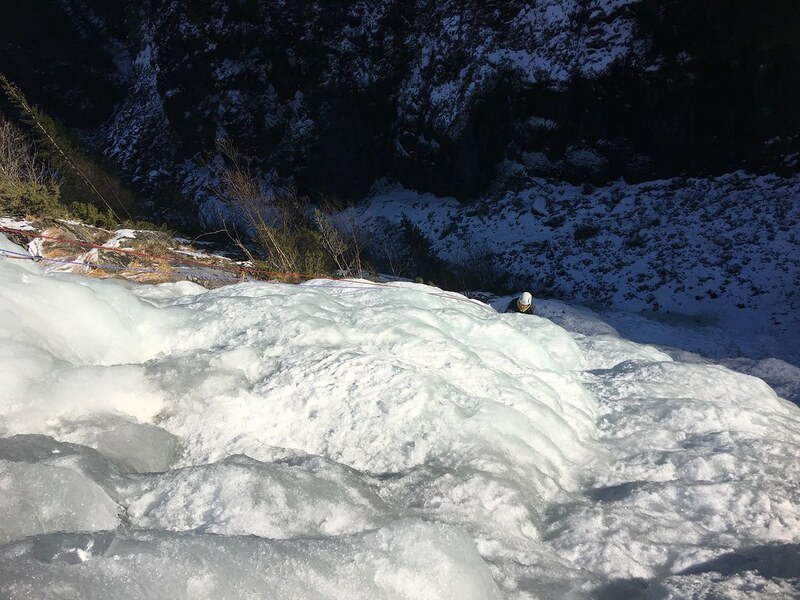 It wasn’t the only injury of the day as Stuart bashed himself in the face trying to get his axe out of the ice and Jared twisted his ankle coming off a route. 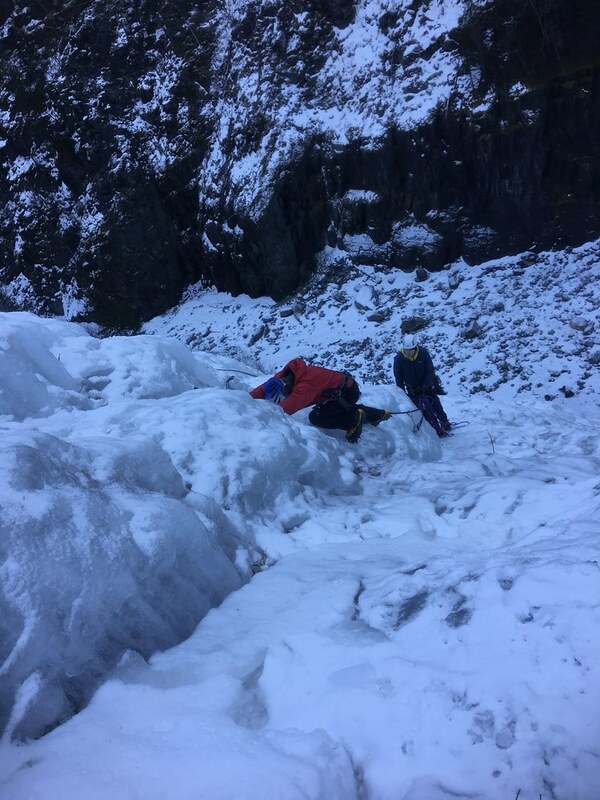 At this point I was keeping a mental list of injury free climbers in our group. After a day off from climbing to hiked up Gaustatoppen in gale force winds and sub arctic cold (that’s another story!) 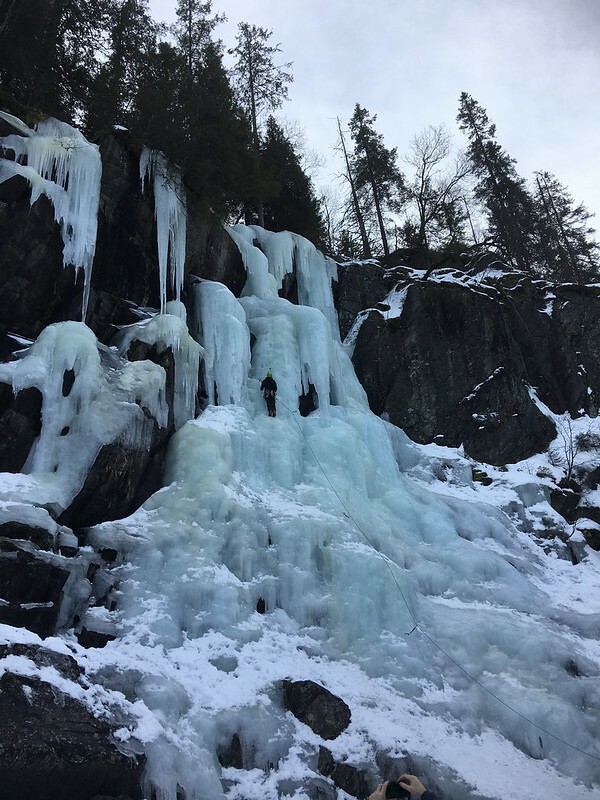 I headed to Upper Gorge with Elliott, Alex and James to climb Lettvann, my first multi pitch water ice route. 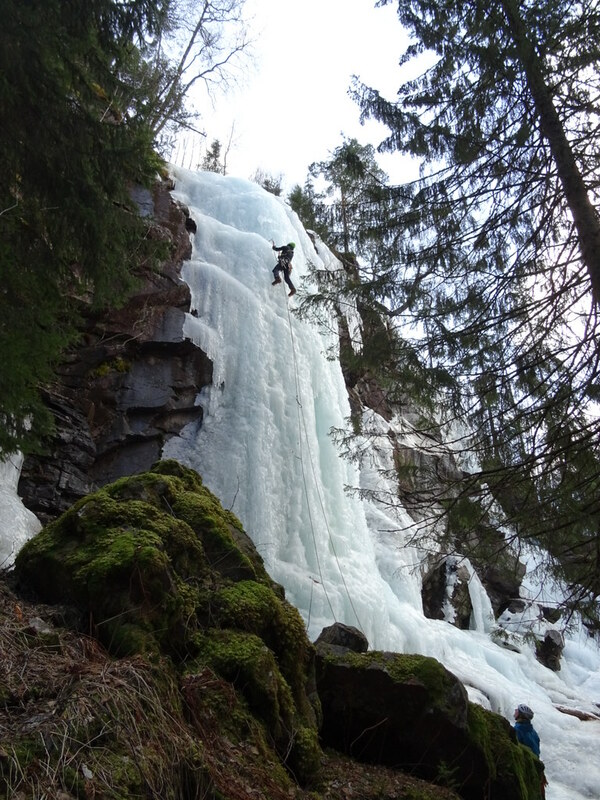 Upper Gorge is the next series of waterfalls down the valley from Krokan and has some fantastic multi pitch routes. 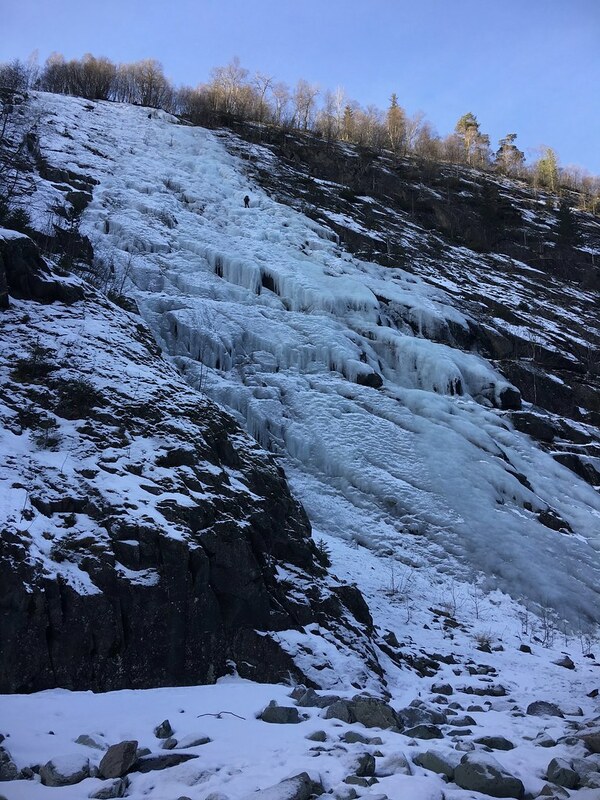 Lettvann is only graded WI2 and 3 pitches, which after two days climbing harder grades I felt confident was well within my ability. 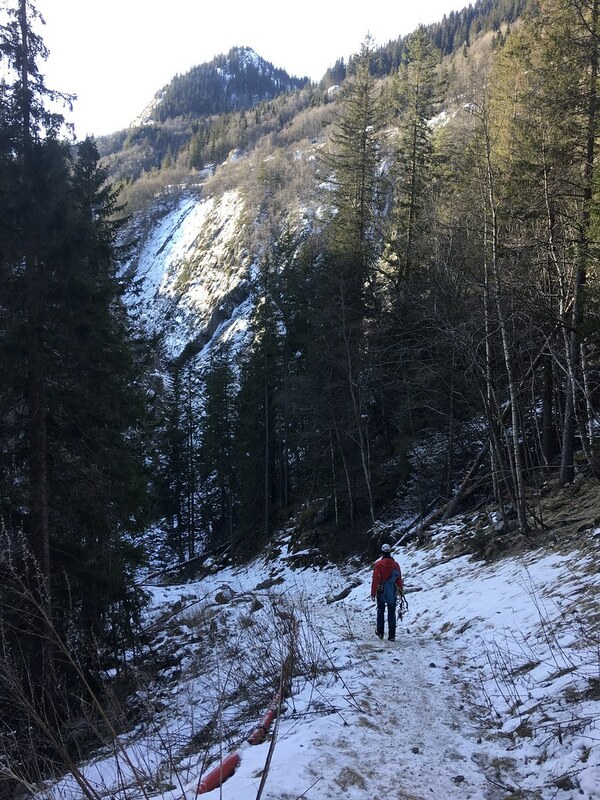 I learnt an important point on Lettvann. 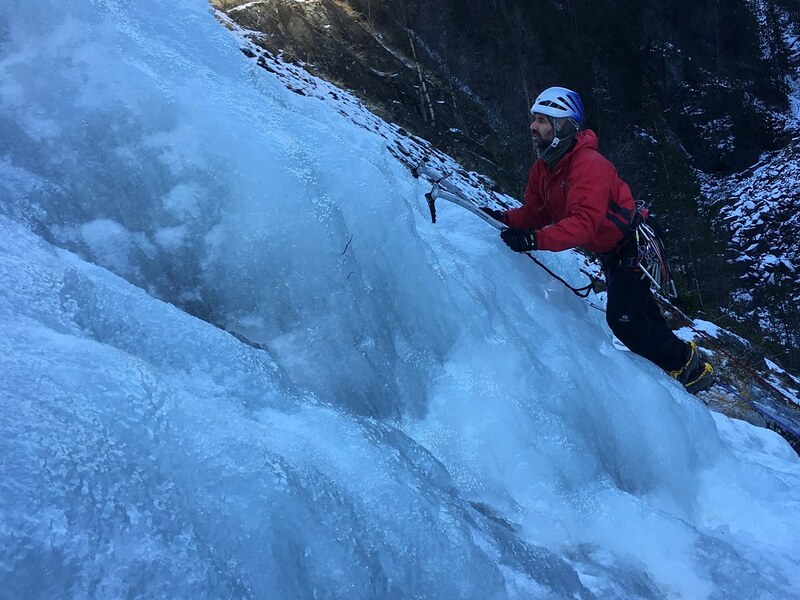 Whilst it is graded WI2 and well within my comfort zone, being a slabby route it was much more punishing on my calves than some of the short steeper routes I’d been doing, due to the need to keep your front points in and your heels down. 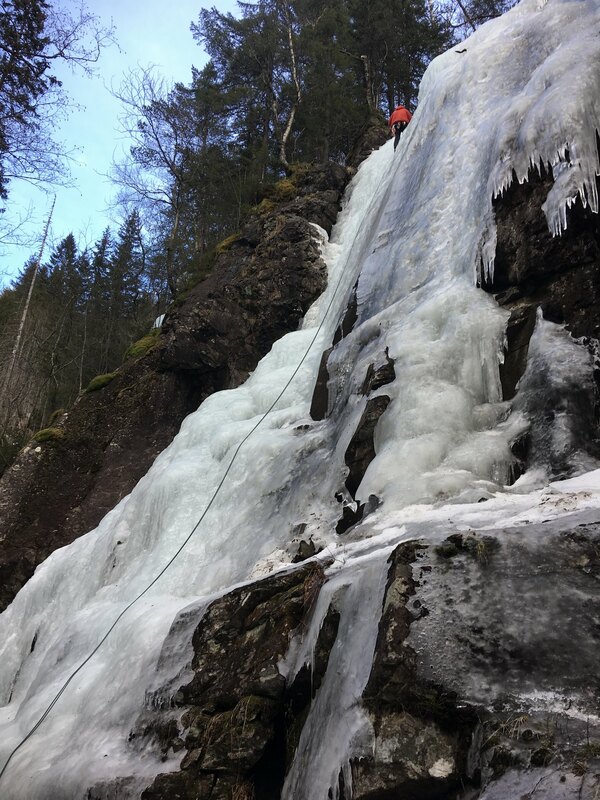 It took most of the day to climb the 3 pitches of Lettvann, with us eventually topping out in the sunshine in the woods. 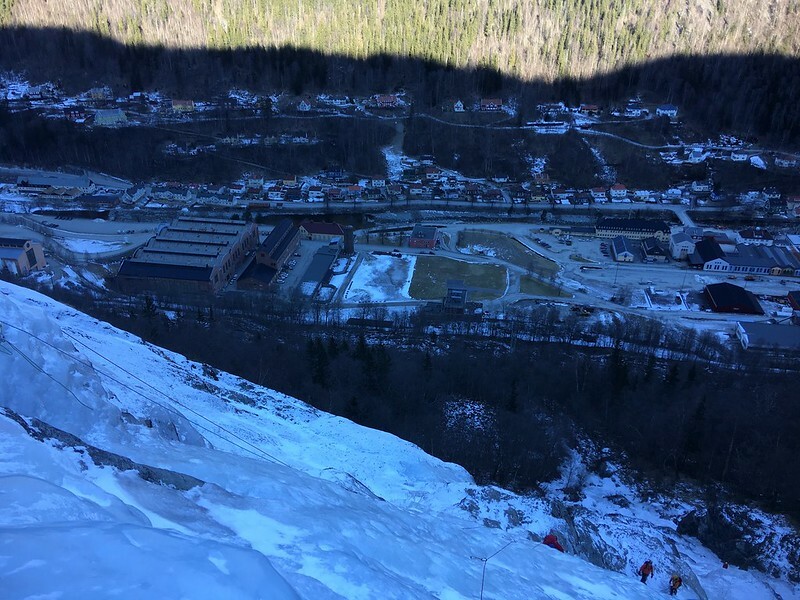 The following day Elliot, Alex and I headed out early to do Fabrikfossen a 7 pitch route within walking distance from Rjukan town centre. The walk in to the waterfall isn’t fun; bashing through woodland to reach the bottom of the waterfall and it takes about a hour. We started early to beat other teams but despite this we were climbing as a three and so were quickly overtaken by pairs climbing. 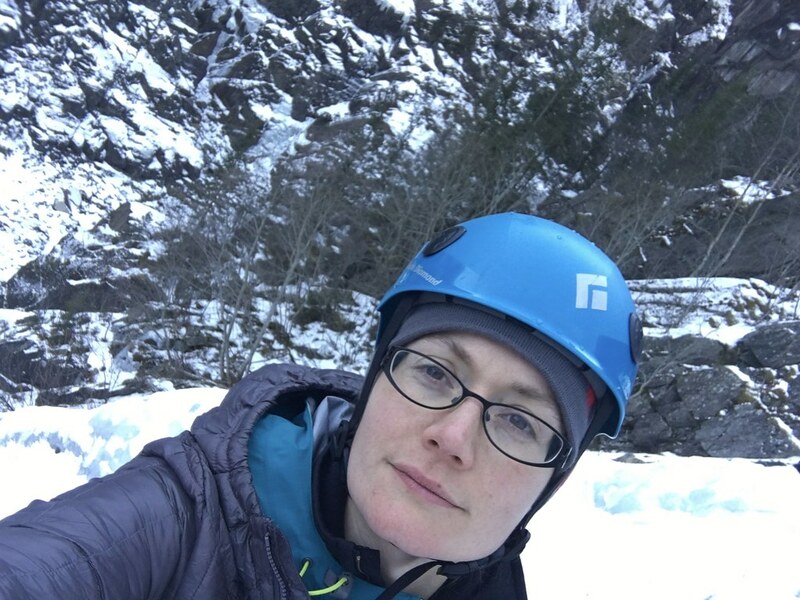 Fabrikfossen is a classic route to do but being in the shade all day it was really cold and being slow as a group of three I spent much of the time dancing on the belays in order to keep warm – despite having 5 layers of clothing on. Whilst disappointed with not completing the route, the abseiling back down through the trees and then the walk back to the road took nearly 2 hours so we were glad not have finished the route in the dark. 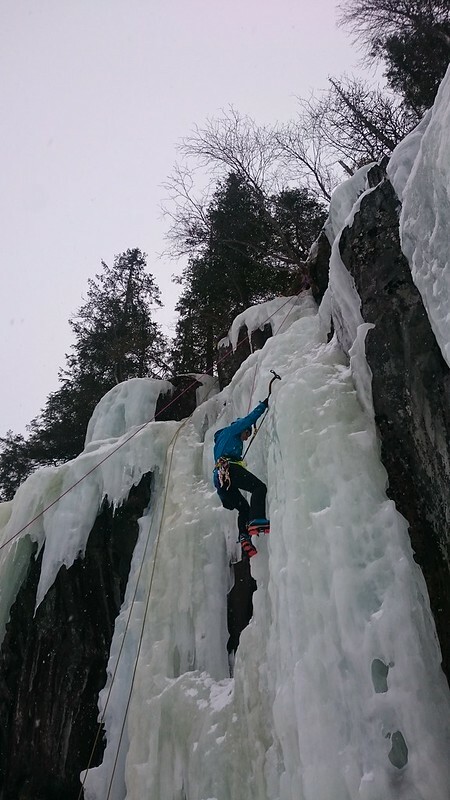 We finished the week with another day climbing at Krokan. 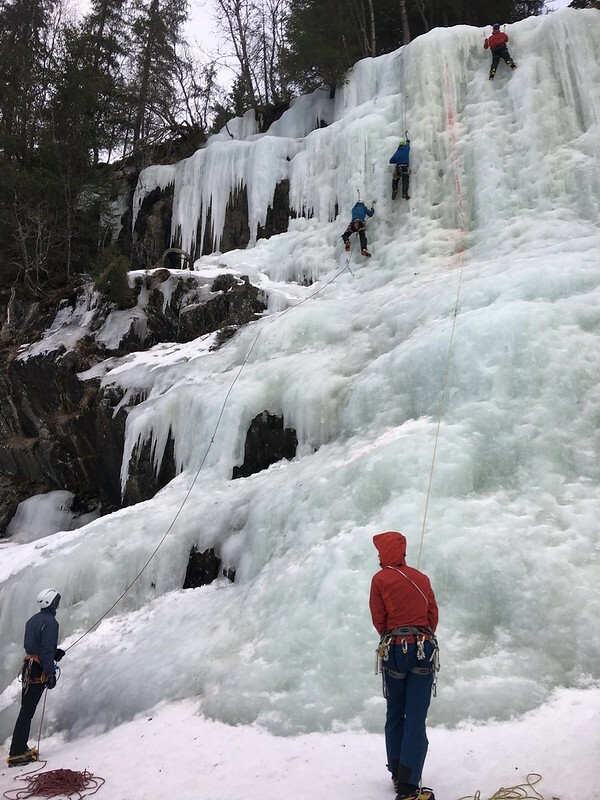 I had started the week wanting to lead a route. 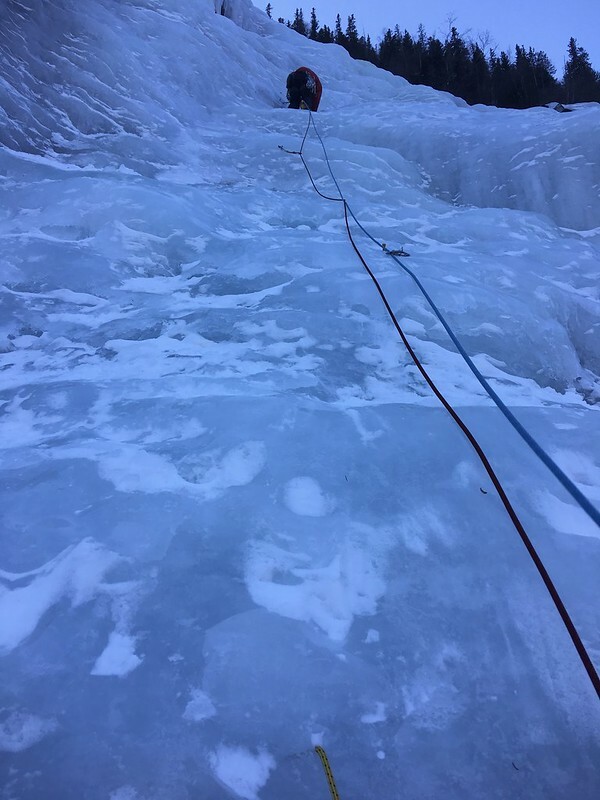 But after a week climbing I was pretty knackered and mentally drained so opted for pushing my grade on a top rope instead. So I was quite pleased to climb my first WI5 as my last route of the trip. Much more arm pumps by kinder to the calf muscles that the last 2 days.